Today starts, as most days on our visit to Omi Marga do, with breakfast at her place around 0930. Here you see our table set, just moments before we dig in. 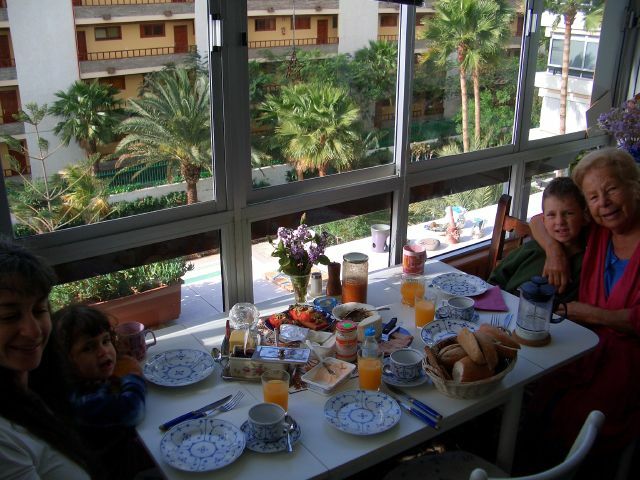 There's two types of jam (one is plum, home-made), slices of tomato with avocado and onion, freshly-squeezed orange juice, local honey, just-made duck-liver paté, fresh rolls from downstairs, quark, alioli, cream cheese, serrano ham, and on the stove, local eggs with bright yellow-orange yolks. Lila and Isaac were hungry, and not thrilled with the delay of photography. 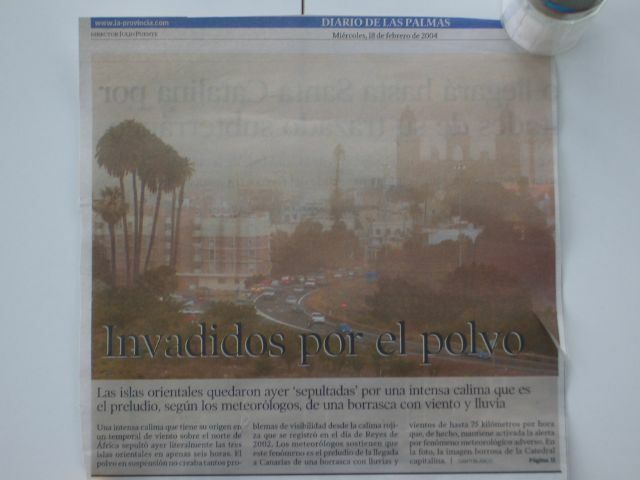 Today's paper - La Provencia / Diario de Las Palmas - has an article about the recent fierce weather. 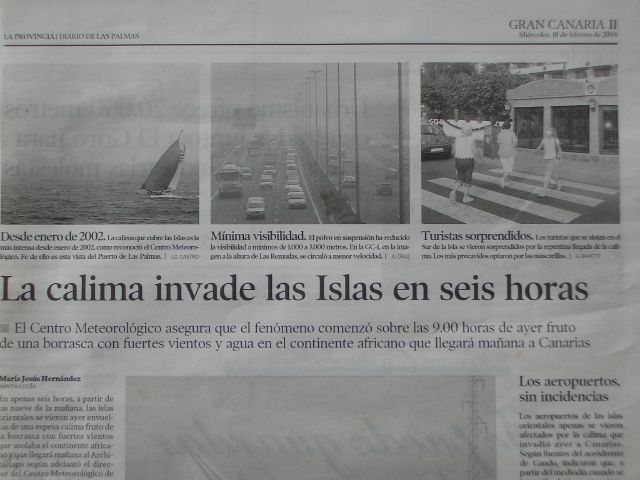 Entitled La calima invade las Islas en seis horas (The calima invades the Islands in six hours), it shows in words and pictures the impact of the fine dust on navigation on the water, land, and on the humans. There's a garish photo in sepia brows with the title Invadidos por el polvo (Invasion of the dust) splashed across the bottom. After breakfast the kids some time in the arcade downstairs. 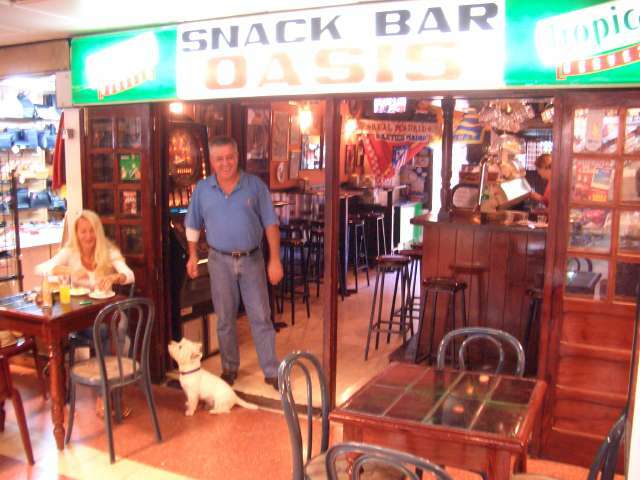 The prices have been raised in all of the very common arcades, from a half-euro to one. (At the current exchange rate, that's a jump from US$0.60 to double that. 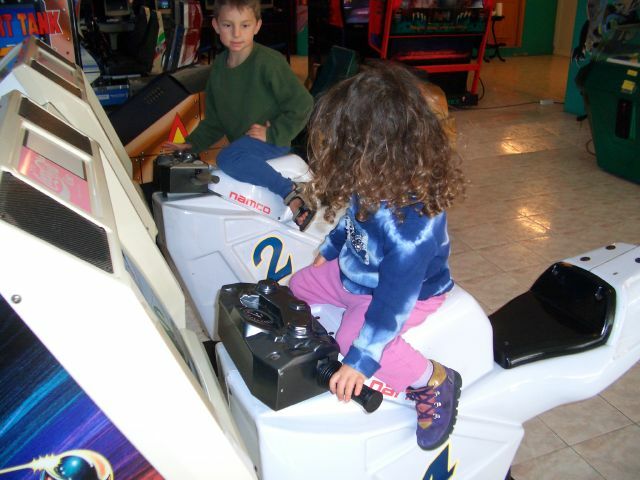 That's right, $1.20 per arcade ride.) Luckily for us, the kids are happy to play without demanding a coin - actually that would be two coins for the two of them - every three minutes. We'd use up our travel budget quickly. Today, whilst playing at the C. C. Yumbo", we met a Scottish family with whom we hit it off. Colin, Jackie, and their kids Neeve (pronounced "knee-v") and Mimi. Cousin Nadine ("NAH-deen", rather than the American "neigh-DEEN") too. 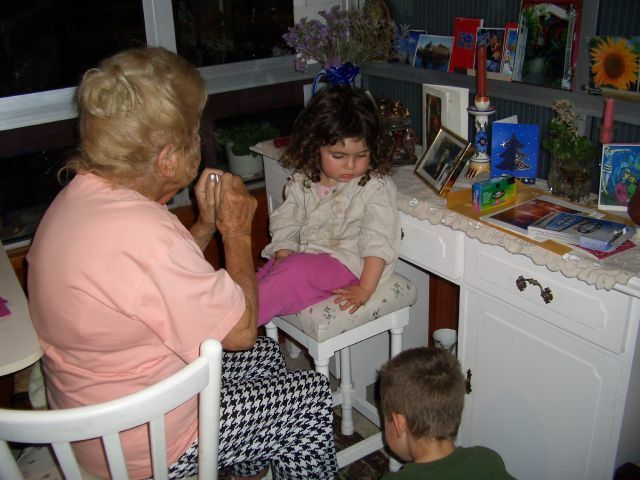 After dinner, crispy duck a lá Omi Marga, the kids play with Omi Marga as I pour two glasses of Hierbas Ibesenco, a gift from Uncle Daniel. 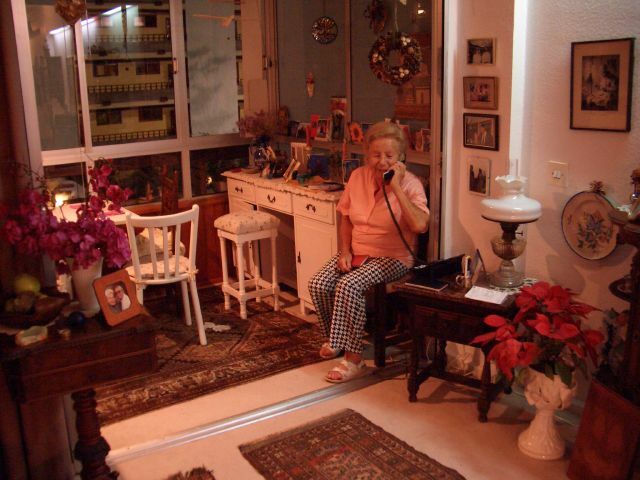 As we head out the door, back to our beds, Omi gets a phone call. This is how I imagine her as we call. Tomorrow we enjoy a La Belle drag show with new friends.